Mr. T (no, not that Mr.T - Robert Hooks, who predated the mohawked maniac by many years) is one cool cat. He’s got the flyest threads, the coolest car, the hottest women, and the most no-sweat attitude to life anyone has ever seen. But he doesn’t ever brag or show off, he keeps an understated cool at all times. It’s not entirely clear what Mr. T does exactly, but he’s licensed to carry a gun (and to kill, presumably) - but he notes he has licenses to do many other things as well. Being a jack of all trades, two men, Chalky Price (Winfield) and Pete Cockrell (Waite) hire Mr. T to protect them against the men that are invading their illegal, underground gambling circuit. When a murder occurs during one such gambling outing, both Police Chief Marx (Smithers) and crime honcho Big (Harris) want Mr. T’s head, though he’s innocent of the shooting. Things get a lot more complicated from there, but suffice to say, Mr. T never loses his cool. But will he get out alive? In our estimation, Trouble Man is one of the best films from the Blaxploitation period of the 70’s. It’s a crying shame that it was never released on VHS in America, where it then could have really developed the standing it deserves. This lack of presence in video stores may help to understand why this title isn’t mentioned among the old stand-bys of the genre such as Shaft (1971) and Super Fly (1972). But it did develop a following over the years nonetheless, and Fox finally released a nice DVD in 2005. Director Ivan Dixon has an immense career in the entertainment industry, but only really dipped his toe into Blaxploitation waters, having directed both this and The Spook Who Sat By The Door (1973) the following year after Trouble Man. Having been 42 years old at the time of his helming of this movie, it’s reasonable to assume he wasn’t entirely sold on the notion of so-called “Blaxploitation”, and spent a large chunk of his career in TV, both in front of and behind the camera. But he and writer John D.F. Black imbue this film with a lot of sly cleverness and wit, rising it above many of its contemporaries - but like Mr. T himself, not in a loud or showy way. Perhaps the most memorable aspect of the movie, to a large portion of people anyway, is the excellent Marvin Gaye soundtrack and title song. Many people knew Gaye’s music from the movie far more than they knew the movie itself, having been released contemporaneously with the film on Motown Records. The utter coolness of Mr. T, the impeccable writing and direction, and the Marvin Gaye music make an unbeatable combination. 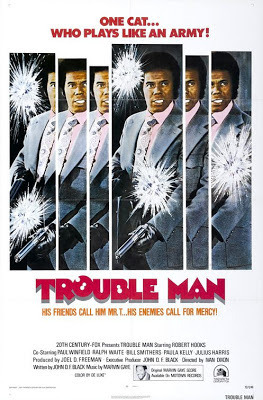 With Trouble Man, you can travel back to a time when every man wore a suit (with a wide tie), dudes hung out in pool halls, and if you wanted to contact someone, your only choice was rotary phone. All of this just adds, as if it were necessary, another fascinating layer to this movie. 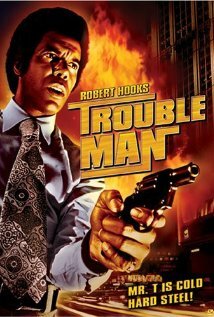 Movies in general have only gotten worse, not better, since Trouble Man. Long live Mr. T.
Also check out a review by our buddy, The Unknown Movies! Oh man, you sold me on this one. I'm on it! This sounds great! Nice! If you love Blaxploitation, this is a fun one. Robert Hooks at his absolute coolest.